Located in Prague city centre, within 50 metres of the Old Town Square, the Residence Tynska Serviced Apartment welcomes you in an historic mansion, that, built in Renaissance style, went through several further reconstructions until the 19th century. 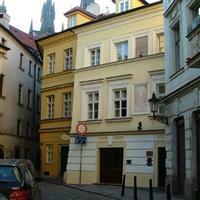 This residential house, an important part of the Prague architectural heritage, is now under the UNESCO’s protection. This Prague Serviced Apartment provides comfortable and cosy accommodations in an elegant and quiet environment. The house has five storeys. The top floor had been converted into private attic flats. On the ground floor there is a small studio suitable for tourists or people on business trip visiting Prague for a short period of time. On the first and second floor there are fully furnished flats, suitable for managers, non-residents or people coming for professional practice, which can be used for a longer stay (minimum is two months). Please Note: You need to provide information about your estimated time of arrival to Prague (airport, train station or bus station).